Remember when you bought your home? It was just perfect for the two of you. But now—with a couple of kids, some ever-shedding pets, or maybe an in-law living down the hall—that’s no longer the case. 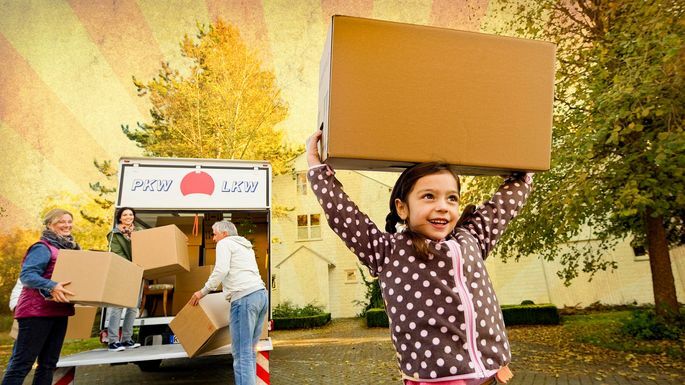 Whether you’re already bursting out of your house or about to expand your family, the time to move to a larger home might have arrived. If it’s any consolation, you have plenty of company. In 2014, a record 60.6 million people, or 19% of the U.S. population, lived with multiple generations under one roof, a Pew Research Center analysis of U.S. Census data found. If you have older kids, you can’t even count on having an empty nest, now that the preferred living arrangement for 18- to 34-year-olds is with their parents (more than alone or with a roommate). And more than one-fifth of Americans older than 55 live in a multigenerational household, as well. So what do you look for in a home when you’re bringing so many people under one roof? There’s plenty more to consider before you upsize beyond just square footage. Topping the list: how to upgrade your home without fully downgrading your bank account. Yes, upsizing will cost you, upfront and on down the line. But that doesn’t mean it’s a bad investment. It just means you need to be smart about it. Here are six things to keep in mind before leaping into a larger home. Yes, we get it: You want more space. But have you thought, specifically, about why? Before you hit the house-hunting trail, take a moment to pin down what you really, actually need, suggests Suzie Mayes, a real estate broker at Living Room Realty in Portland, OR. “How are you actually going to live in this bigger house? For example, why do you want a bigger kitchen?” she asks. “If you’re going to be hosting Thanksgiving moving forward, maybe that makes sense.” But otherwise, perhaps not so much. Listing your goals will help you prioritize, adds Christine Wren, a Realtor® and certified international property specialist with Keller Williams Realty in Austin, TX. In other words, have a plan and find a home that works into it. Before beginning your search, consider not just the home’s square footage, but also the layout, says Kim Trouten, a Realtor and designer with Allen Tate Realtors in Charlotte, NC. You might think you’re getting more space, but if that space isn’t useable or feels tight, does it really help you in the long run? On a related note: Before you speed forward with your upsizing plan, you should make sure the rooms or features in the larger house will actually be used, Trouten cautions. Are you prepared for the real financial burden of upsizing? “It’s not just the sticker price on the house; it’s the long-term costs associated with it,” Trouten says. “When you go up (in square footage), you get higher property taxes, higher utilities, and more maintenance.” And acquiring more rooms means shelling out for more furniture, too. Make sure you can afford to move up without becoming “house poor.” You can prevent this sad fate by using online affordability calculators to figure out how far you can stretch your dollar. Or talk with your lender to get the big picture on the costs of your move. Pro tip: If you call the utility company, you can usually unearth historical data about the energy costs for a particular address year over year. Upsizing now can mean a tidy profit later if you choose your home and location wisely. Sure, you might think that once you’ve found the right size home, you’ll stay forever. But you might find yourself downsizing a few years from now. As with any home purchase, look at your potential new place through the eyes of future buyers. That means doing your research about what home buyers want. And right now, that’s flexible space. “We get more asks about guest bedrooms than anything else, because as baby boomers age and their kids buy homes, they’re thinking about when Mom and Dad may visit or live with them,” Trouten says. Keep the latest buying trends in mind as you scope out listings, and your new home could pay off down the road. After you’ve predicted the future, don’t forget what you learned from the past: It’s all about the neighborhood. Perhaps your starter home is in the perfect up-and-coming community—close to the city, public transportation, and your favorite craft brew pub. But having more room to spread out often means spreading farther away from the city center. So make the choice. Are you willing to move to a different neighborhood—one that might be far from where you live now? Life is about trade-offs, right? This might be a really smart one.